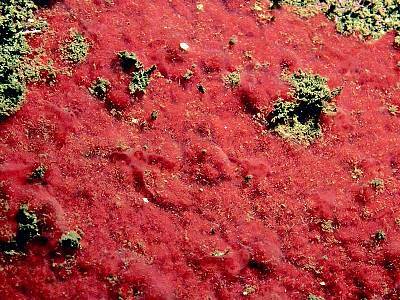 Description: This a bright red coloured encrusting sponge with a 'bumpy' surface. It often grows in large patches (30cm across) on silty bedrock, usually only the raised bumps can be seen projecting through the layer of silt. 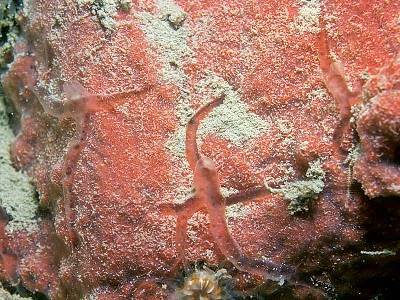 Habitat: On deep upward facing bedrock on exposed coasts but also on sheltered cliff faces in Kenmare River, Co Kerry. Distribution: Known recently from Kenmare River, south-west Ireland, and scattered localities on the west and north-west coasts of Ireland. 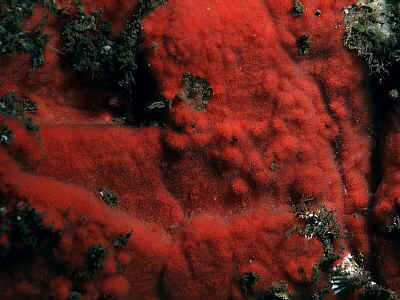 Similar Species: Can be difficult to distinguish from other red crusts, especially Microciona spinarcus which also has a 'bumpy' surface, but the particular shade of red and the vermiform spicules are characteristic. Picton, B.E. & Morrow, C.C. (2016). Bubaris vermiculata (Bowerbank, 1862). [In] Encyclopedia of Marine Life of Britain and Ireland.